As a homesteader, it’s tempting to want to do all the things. How do I know this? Because homesteading is awesome, and I want to do all the things! Unfortunately, this is the perfect ingredient for becoming an overwhelmed homesteader. There is not one single homesteader out there who does everything that falls under the category of homesteading. I’m not kidding! You simply can’t do everything, nor are you supposed to. Sometimes we get in over our head, but we don’t want to admit it. I’m here to tell you it’s completely and totally okay to scale back. You’ve all heard of chicken math, right? You start with four chickens and pretty soon you have forty. Well, this so-called chicken math can be expanded to homestead math which is similar in the sense that you start with chickens and then you need goats and then you need a cow and then you need more gardens and then you need bees and then….kind of like Idlewild Alaska talks about in this funny piece. Homesteading can be fun—as well as fulfilling—and it’s easy to want to take on more and more. But we have to be careful because there is a big difference between I can do a ton of things on this homestead kinda sorta well and I can do a few things on this homestead really, really well. One of those things works out. The other often leads to an overwhelmed homesteader who is buried under produce that’s rotting or crying in the chicken coop or just. plain. burnt. out. Maybe last year you could comfortably handle 12 chickens and then decided you’d do even better with 60. Maybe you were right or maybe you were really wrong. Maybe you discovered you liked goats so much that suddenly your 2 goats became 10. Or 23. Maybe your one small garden turned into two huge gardens. And a corn patch. And a grapevine. And some apple trees…and maybe you’re still wondering why you’re so busy. Listen. I’m going to give it to you straight. Adding things to your homestead, be it animals or gardens, generally means that you’re asking yourself to do more with the same amount of time and money as when you had less on your homestead. Sometimes, unfortunately, our resources get stretched too thin. It’s very, very easy to become an overwhelmed homesteader. 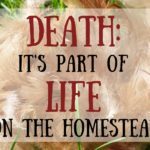 If you feel like an overwhelmed homesteader, it’s a good idea to re-visit the purpose of your original homestead dream. What were the things you wanted to do when you first started homesteading? What were your dreams and plans for the future? Why did you decide to start homesteading in the first place? And is that what you’re doing now, or did you follow a wayward train track of increasingly out of control plans off a cliff? One thing new homesteaders commonly get sucked in to is raising animals for other people—family and friends. Raising vegetables or meat or eggs or animals for other people is great—if you want to do it—but it’s a whole different ball game than just having a few for yourself. Another thing that can be tempting about living on a homestead is the prospect of raising enough chickens, pigs, or garden goodies to sell. I will tell you what it is. It’s one hundred. more. chickens. Sit back and take a moment to think about why you’re on the homestead. Why are you doing what you’re doing? If what you’re currently doing doesn’t ring true to the purpose of what you and your family wanted to do, it’s time to gather the troops and re-configure. Homesteading can be challenging; it’s even harder when you feel like an overwhelmed homesteader who veered down a different path than the one you intended to be on. …you only plant one of your three gardens. …or raise 1/3 of the chickens you normally do. …or skip a year of having pigs. …you’re just mentally or physically exhausted and need a break. It happens. And it’s okay. Animals and gardens need to be cared for every single day regardless of what’s going on in your life, so pay careful attention to what’s going on in your life. Are you an overwhelmed homesteader? Do you need to scale back this year? As homesteaders it’s easy to get in over our head. When this happens, it’s important to know that we might need to scale back—way back—and that it’s perfectly okay to do so. Repeat this until you believe it with your whole heart. Aw, thanks for the shout out! I would love to do all the homestead things, but I get stressed out over my current to do list! Lol But I love it and wouldn’t change a thing. Great post! I need to put this on my refrigerator to remind myself daily. We’ve had some big changes in the past year and have scaled back on some things (fewer chickens, not breeding the dairy goats, not raising meat chickens this year), and have increased the size of the garden. We might resume some of those things next year, or we might not, but it’s ok. It’s just the two of us now that the children have grown up, so we don’t need to do/raise/grow as much.